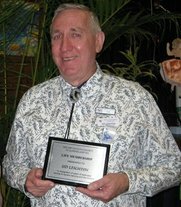 Sid Leighton was born in Brisbane on 11th March 1945 and has spent most of his life within the Square Dance movement. “B-Bar-L Hoedowners and was run by Peter and Evelyn Johnson. S-Bar-B Square Dance Club. By his own admission, he did not call well but in 1963, he won the same competition and was off and running. Early calling experiences included one night shows and a Friday evening club at the Petrie School of Arts Hall. During these years of calling, Sid has operated clubs in Stafford, Petrie and Banyo. He also ran a club called Sunshine Stars at Toombul. 29th April 1967 in the St Margaret’s Church of England, Sandgate. Sid and Betty have two daughters, Cindy, born 23rd January 1979 and Kristy, born 17th August 1984. Sid was driven to be to be a Square Dance Caller, because of his love for the movement and his desire to work with people. He has watched the activity evolve - from the boom years of its heyday of overflow-ing halls to clubs of one or two squares and from the children and teenagers to the older generation that now frequent our dance floors, he has seen it all. Always a thinker, his main fears for Square Dancing’s future are the lack of numbers now being attracted to the activity and also the way Calling and Dancing standards have changed, possibly even declined. Never far from his mind are questions like – Where will the activity be in 10 years time?, What can we do to ensure that Square Dancing has a future? and, to quote George Jones, Who’s gonna to fill their shoes? when veteran callers retire. It is because of these concerns that Sid continues to promote the benefits of Square dancing and Calling by mentoring newer Callers and encouraging dancers of all ages to enjoy the activity. After many dedicated years to the activity, in 2012, Betty Leighton was presented with the Square Danc-ing Society of Qld’s Roll of Honour Award and Sid was presented with Life Membership to the Square Dancing Society of Qld. Sid, Betty and Lyn Macpherson, another Brisbane Caller, are co-convenors of the 33rd Qld State Square Dance Convention being held in the Moreton Bay Shire on 27th-29th September 2013. Sid and Lyn are also Co-Callers for Brisbane’s newest Saturday night club, Taigum Twirlers, which commenced dancing on 11th February 2012. Sid Leighton has achieved many milestones in his lifetime. He is a suc-cessful business owner, a loving husband and father, an engaging mentor and a loyal friend. He has been committed to providing quality entertainment on the dance floor and, in 2012, celebrated 50 years of Calling. Sid has recently been honoured by Callerlab for this achievement.